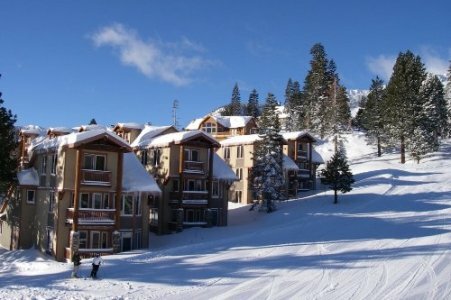 Listed below and updated daily from the MLS are condos for sale in Eagle Run, a condo development located in Mammoth Lakes, CA. For additional information on any of these Eagle Run condos for sale in Mammoth Lakes, click the "Request More Information" button when viewing the details of a property. We can provide you with disclosures, past sales history, dates and prices of condos recently sold nearby, and more. And, be sure to register for a free account to automatically receive email listing alerts whenever new Eagle Run condos hit the market in Mammoth Lakes, CA, that match your specific search criteria. This ski-in, ski-out development is located right on the ski slopes in the Eagle Express/Chair 15 area. These luxurious condos offer two different floor plans: 2-bedroom, 2-bath with approximately 970 to 1,133 square feet and 3-bedroom, 2-bath townhome (no one above or below you) with approximately 1,371 square feet. The units feature spectacular views of either the ski run, down valley of White Mountains, or southwest views of the Sherwins and Valentine Reserve (depending on the unit location), propane forced-air heating units, propane gas log fireplaces, laundry in units, and unlimited hot water. The complex amenities include two outdoor spas, underground parking, elevators, off-street parking, unlimited propane (which powers the forced-air heating system), heated walkways, and use of Juniper Springs Lodge shuttle service, swimming pool, workout facilities and BBQ areas (provided you have your unit on the Juniper Springs Rental program).